I don’t often write when I’m in a better mood, and I’m working towards changing that. My offline journal entries are filled with dark thoughts about death and how peaceful it would be to end the pain, but I do also enjoy a few days of sunshine up there- when it feels like my buoyant mood will last more than just a moment. Today is one of those rare days I feel like I’m normal. Happy, almost. The worst thing about being depressed isn’t being at the bottom all the time; it’s rather knowing that these precious moments of happiness can happen to you, but are rather unpredictable and short-lived. The new medication I’ve switched to about two weeks ago started working instantly, which I hear is a red flag for antidepressants because that is only a placebo effect since antidepressants usually don’t kick in right away. I think when I switched, just the lack of Wellbutrin in my system gave an appearance of recovery and less anxiety in general, and I stupidly took that as a sign that it was the right drug and I thought was finally cured as long as I could take this drug. A few more days passed, and the symptoms of my depression returned; I still couldn’t stay asleep or want to eat, the thoughts of suicide, hopelessness and general discontent with my existence came back and I made a lot of the people around me very miserable. My brain, not thinking rationally, brought up my insecurities of my friends and family leaving me for good. At those moments, I thought I was really going to lose it all, including my life, and at the same time I felt that I had nothing to lose. My mom and I went to her place in New York City for a while to see if a change of scenery would help with my recovery. We thought maybe a longer trip (something more international) would do me some good, but I really didn’t have the mental strength or energy for that kind of travel, so we settled for just New York. I love New York, and I would love to live there at some point again, but when I returned, everything looked so drab. The colors were completely drained out from the place, and if you know New York, it’s can be quite colorful. It was so completely alien to me- the people rushing in and out of the packed subway trains, cute cafes, Grand Central station, the fancy shops on 5th ave, my favorite bookstore the Strand, the Bryant Park library that I used to love because of its beautiful garden… Everything I love about the bustling of the city was just not there for me. It was more like that it was still there, but I felt nothing. I felt hollow and so alone in my sadness within the crowd of the 8 million people plus tourists. I had leaden limbs, where I couldn’t move from my current position unless someones else willed me to, or if there was a phone call. I was dragged out from my bed. I was frustrated with the lack of agency within my body because there were so many things I usually wanted to do while I was in the city and I couldn’t will my body and my mind to want to do them. I felt like a caged bird, trapped in my own immovable body. The trip was too much for me. Everything irritated me- from the sounds of people laughing, couples cooing, to children screaming – and I felt guilty that I felt irritated. My friend told me that I needed to call my doctor because my medication was clearly not working. I didn’t even want to do that. I felt like it wasn’t going to change anything. It didn’t even occur to me that my medication may have been the issue until she pointed it out. After I returned from New York, I hit rock bottom again, but as a psychiatrist said once, if you feel sad after feeling numb, paradoxically as it may sound, you are actually getting better. I was at least feeling something. 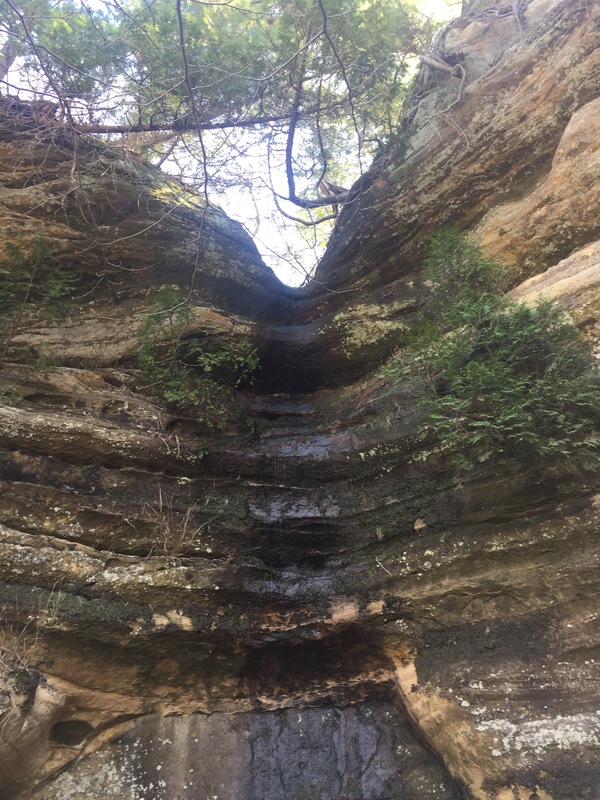 For the weekend, my group of friends organized a hiking trip to Starved Rock, an IL national park, southwest of Chicago. It was in the town of Utica, IL, where there were murals of the American civil war, multiple trucks in the drive way and pro-life signs outside the suburban sidewalks. My boyfriend drove half of us, and we berated (more like regretted) the lack of diversity and religious pigheadedness of the small towns of America like this one as we got there. The hike was around five hours long, and because the area was flooded recently, most of the trail was muddy and very hard to waltz through without getting your shoes wet. Having recently been hospitalized and immobile for many weeks, it was very difficult for me both physically and mentally to continue this trip without complaining. But because I was with my friends and I didn’t want to slow them down, with the help of my boyfriend who carried my backpack, I pushed myself to finish the trail at their pace. It was exhausting, but I was proud of myself for going and pulling through. It brought us a little closer together, and made me feel a bit normal after some of my friends who I haven’t seen in a while found out that I had quit my job. It was reassuring because they still saw me as the same, when I didn’t. I’m starting to understand the importance of having a support group, and catching myself to not push people away when my depression acts up. Depression is an isolating disease because when you’re on the other side, your head tells you lies, like everyone is going to leave and that you are not worthy of love. Your reaction is to leave ASAP before they can leave you, as a way of protecting yourself. When I’m feeling normal, like today, I don’t believe such a thing, and I can’t come up with a reason why someone would leave me because of what I’m temporarily going through. I’m learning to love deeper, with the help of my family, friends and my boyfriend. As a skeptic, I think I have been doubtful and scared of love and people caring about me because I didn’t feel like unconditional love was possible. I thought of myself as a strong and independent person, and I hated asking for help. In relationships, romantic or otherwise, I thought people just wanted things from me, and when they were done taking those things (e.g. knowledge, companionship, money or whatever I had they wanted from me), they would end the transaction and go find someone else. Even for my parents, I thought when I failed to become successful in their terms, they would not love me the same way because of how they talked about other people’s kids they knew from other families who were not “successful.” I expected my boyfriend to leave when the tables turned because my exes always left when they felt things were inconvenient for them. I thought my friends were going to find more sparkly, more glamorous, more interesting and less depressing friends when they found out about what happened to me. But that’s not what happened. My parents are more supportive of what I want to do (and not want to do) with my life than they have ever been, and we have made so much progress on our communication and understanding of each other. My boyfriend and I are more in love than we have been because he’s shown me that he’s going to be there for me when unexpected things like this happen, and he doesn’t like me just for what I do, but for who I am. I’m starting to trust him more, which was first hindered by my previous experience in relationships, and we are able to be more open to each other about how we feel. My friends have not stopped talking to me since I left work- they invite me to things (even when I have refused to go for ages) and they listen to my hours and hours of crazy talk when I’m in a bad place and I can’t control how I think. It’s hard to be grateful when I’m going through a lot of pain, but I wish I can come back to what I have written here and agree with what I said.